Back again for a 5th year! 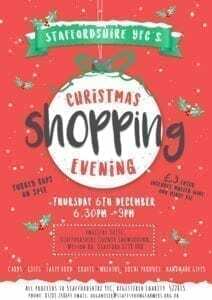 Staffordshire YFC’s Christmas Shopping Evening is the only way to sort your Christmas Shopping needs in December! 60 stalls all under one roof, free parking, great atmosphere, mulled wine, mince pies and festive cheer to help you get organised for the busiest time of year!